A couple of days I was talking to our librarian who made a very interesting statement. "We don't have a library anymore," she said. "The whole school is a library now." Of course what she said is true. On moving to a new campus this school year the resources of the library were dispersed. We now have an iCommons on each floor of the building - these areas are full of comfy chairs, beanbags, cushions, "cave" spaces and of course books - and in each of these iCommons areas is an IT Kiosk where students and teachers can get technical assistance. Inquiry goes on everywhere in the building and the emphasis of the librarian this year has been on electronic resources and teaching the students about the different online books and databases that the school subscribes to. The iCommons website has been redesigned to include a literacy hub, a research hub and a media hub. Recently I've started getting involved in media literacy with our Grade 1 and 2 students. We've started looking at what it means for our students to be literate, and we have decided that it goes far beyond simply reading and writing. With so many different media out there today, it's important for students to be able to "read" the language of photographs, films, advertisers and sounds. My daughter is at university studying art history. She is learning about how to look at a painting and to analyze and deconstruct it from the point of view of an artist. Although she is really good at art, her course doesn't involve creating any herself. We decided, however, that as well as students being able to "read" images, they also need to create and manipulate them. Most people nowadays have access to a camera wherever they are (as they are on most mobile devices) and with a tap on the screen these can be uploaded to photo-sharing websites. We decided that being able to create their own photographic images was an important skill, so with our Grade 2 students we have started by teaching them photography. A few weeks ago we asked students why people take photos, and whether photos can be art. We showed them how to use a camera and talked with them about techniques such as getting in really close to the subject, thinking about the angle, noticing where the camera was focused, considering the light and so on. We also gave a very brief introduction to the "rule of thirds". Having given students some basic instruction on how to use a camera and how to compose photos, we then let them walk around the school with a partner taking photos. After this we showed them how to attach the cameras to their laptops so that they could download the images. Even at this stage it was clear that taking the time to look at photographs and think about some simple rules before taking photos had a remarkable impact on the quality of the photographs that the students were able to take. Our next step would be to edit these photos. We chose a very simple, free, online editing tool PicMonkey. This actually has a lot of possibilities, but for our purposes we wanted students to be able to crop their photos, enhance the colour and possibly change how sharp the image was, and to be able to frame it. Students worked on a choice of 2 or 3 of their photos to make them really special. They then added them onto a Google Slideshow and gave them a title. We're going to turn this presentation into an eBook using FlipSnack. The results have been amazing to us. The composition and editing have been really creative. Take a look at the photo at the top of this post which was shot and edited by a one of our students today. 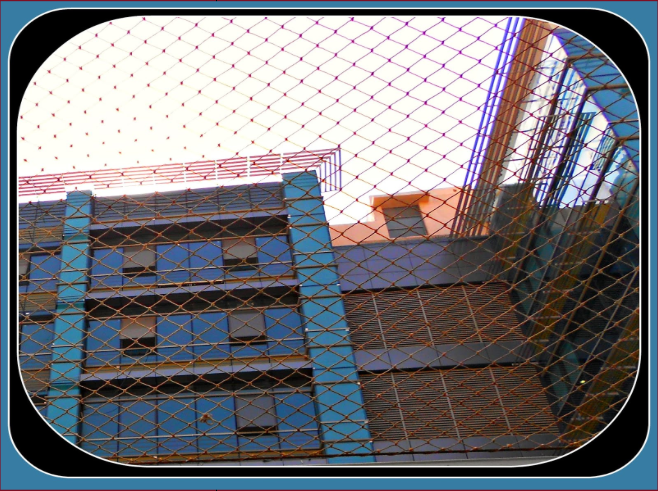 He has thought carefully about the angle, composition, colour and light and made a choice to take the photo through netting to give an impression of the tall building next to the school, and he has then gone on to think about adding a double frame and picking up the colour of the building and adding it to the frame. Even at the age of 7, he is someone who is already becoming confident in "speaking" the language of images. Very inspiring school you work at! I have read through your blog a bit, but is this all done through BYOD? My current international school tends to have limited resources, which really limits what you can do in the classroom. I have started asking kids to bring iphones or cameras so we can do different activities, but in no means is it a school initiative. I love the ways you coach students to show creativity! Hi Wendy, we are completely BYOD from Grades 6 upwards, and we currently have the option of BYOD for students in Grades 4 and 5 too. If students don't bring their own devices they use a school laptop in Grades 4 and 5. In Grades 1 - 3 all students have a school laptop. As far as the photography is concerned, we have a set of 10 cameras which I use for the media literacy. Students shared the cameras one between two. A subject after my own heart! Well done Maggie. Visual literacy is becoming increasingly important in these times. It's something I want to pursue and may well try and specialise in next year as I move on.